A friend once told me he loved reading John Howard Yoder’s work because Yoder is a master of systematically building a careful argument, but often the complexity of his writing makes his work inaccessible to laypeople. I, for one, am convinced that even the best theology is worth little if it cannot find its way into the hearts and minds of God’s people. 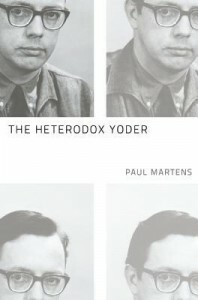 Earlier this year we posted Branson Parler’s critical review of Paul Martens’ The Heterodox Yoder. Martens’ was kind enough to respond to our review. Today we conclude the conversation with a reply by Branson Parler. I am thankful for Paul Martens’ substantial and serious response to my lengthy engagement with his recent book, The Heterodox Yoder, and to The Englewood Review of Books for inviting a brief reply to Martens. Many issues could be addressed, but I will briefly highlight five that stand out. Martens and I seem to have moved closer together on the issue of whether or how Yoder is reductionistic (or not) in relation to the sacraments. If I understand him correctly, Martens acknowledges that Yoder does see multiple layers of meaning in, for example, the Eucharist. In that respect, Yoder is not reductionistic, reducing all other possible meanings into the economic aspect. Rather, Yoder is arguing that other meanings build on top of the socio-economic meaning of the Lord’s Supper. From there, the question remains: who gets to decide which layer is most basic? And on what basis? (I would assume Scripture). Furthermore, if the socio-economic layer gets eradicated, have we lost something that is crucial, according to Scripture? This response is directed at the longer ebook version of Branson Parler’s review. When one writes a book suggesting that an important Christian thinker might best be understood as heterodox, one expects a swift and strong response. In these respects, Branson Parler has not disappointed with his thirty-eight page ebook—The Forest and the Trees: Engaging Paul Martens’ The Heterodox Yoder—that appeared a mere two and a half months after the publication of my The Heterodox Yoder. I sincerely appreciate the conviction evident in Parler’s engagement. Although the length of his review is oddly flattering, it is absolutely clear that his ebook is an energetic attempt to reject my rendering of Yoder: following a brief summary of my argument, it provides a lengthy explication of three central elements of Yoder’s authorship—politics, Christian particularity, and sacraments—that allegedly undermine my argument, ultimately leading to a pithy (and rather brazen) conclusion that not only overturns my application of the proverbial “forest for the trees” imagery but also appropriates and extends my invocation of heterodoxy in order to claim that my reading of Yoder is analogous to heresy. Parler correctly observes that I view Yoder’s thought as a sort of cautionary tale and that I believe it is important to avoid reducing Christianity to ethics (not, however, because of my experience in Anabaptism but simply because reducing Christianity to ethics is problematic theologically – my experience in Anabaptism has simply illustrated this problem). Yet, Parler also claims that The Heterodox Yoder “only confuses rather than clarifies things” because I do not account for the “whole forest” of Yoder’s corpus (37). At the gracious invitation of The Englewood Review of Books, I offer the following comments of response in order to clarify what I take to be (a) missing from Parler’s analysis; and (b) misleading in Parler’s description of three central elements—very significant trees, to continue the metaphor—of Yoder’s thought. (PDF, should be suitable for most e-readers). For those interested in the thought and legacy of John Howard Yoder, Paul Martens continues to be an engaging and provocative voice. In The Heterodox Yoder, Martens clarifies and crystallizes his overall reading of Yoder, which he began exploring in his earlier work. Martens continues to raise important questions surrounding Yoder’s thought and, in doing so, forces us back to Yoder’s text. I will briefly survey his argument before offering a lengthy critique that engages specific points in detail. John Howard Yoder, The Old Testament and the People of God. The Old Testament and the People of God. For most Christians, the Old Testament is difficult. What sense can we make of all its wars, violence and crudity, and of the God who is guiding Israel through all of these things? There are undoubtedly many parts of the Old Testament that are difficult to reconcile with the person and mission of Jesus that we find in the New Testament. To resolve these tensions, some people turn to dispensationalism, but that turn raises some tough theological questions about the unchanging nature of God and about how we are to understand God’s mission in the world. Marcionism, the heresy of rejecting the Old Testament, is a temptation for others, and I imagine that many people – including myself at many times in the not-too-distant past – are attracted to a sort of functional marcionism that affirms the Old Testament as part of the Bible, but largely ignores it because we cannot make sense of it. For those who believe that the Old Testament is an important part of the story of what God is doing in the world, but yet can’t make sense of how it relates to the life and mission of Jesus and his followers that we find in the New Testament, John Nugent’s new book The Politics of Yahweh will come as a breath of fresh air. First Look… Exclusive Excerpt from John Nugent’s POLITICS OF YAHWEH. which will debut at SBL later this month. and the People of God. John Howard Yoder is most famous for arguing in The Politics of Jesus that a sound reading of the New Testament demonstrates the abiding relevance of Jesus to social ethics. However, it is seldom acknowledged that Yoder makes essentially the same argument with regard to the Old Testament. Throughout his extensive writings, Yoder offers a provocative interpretation of the Old Testament that culminates in the way of Jesus and establishes the ethical, ecclesiological, and historiographical continuity of the entire biblical canon. In The Politics of Yahweh, presented as a prequel to The Politics of Jesus, John C. Nugent makes Yoder’s complete Old Testament interpretation accessible in one place for the first time. Nugent does not view Yoder’s interpretation as flawless. Rather, Nugent moves beyond summary to offer honest critique and substantial revision. His constructive proposal, which stands in fundamental continuity with the work of Yoder, is likely to provoke much thought from theologians, biblical scholars, and ethicists. Even at points where readers disagree with some of his and Yoder’s interpretations, they will be challenged to explore new perspectives and rethink common assumptions concerning issues that arise from sustained reflection on the Old Testament. Yoder’s reading of the prediluvian narrative focuses primarily on three characters: Cain, Abel, and Lamech. His analysis of the events surround­ing these men’s lives is crucial to his appropriation of the Old Testament for ethics, ecclesiology, and historiography because in them he further spells out the nature of the fallen human social order and the governing state in particular. Yoder’s starting point is Cain’s murder of Abel. By Paul Martens and Jennifer L. Howell,eds. This will not be a full review, as I am taking my time working through Slavoj Žižek’s new book Living in the End Times; I’m only about a third of the way through the book and savoring every word as I go. However, since the book has been out for a few months, I thought that a reflection on Žižek’s brief reference to the work of John Howard Yoder in this new volume might fit well with the content of the current issue. Before I get to Yoder, however, allow me first to summarize the project that Žižek is undertaking here. Starting with the premise that global capitalism is in the last days before its collapse (a premise based on the evidence of ecological crisis, widening social and economic divides and the biogenetic revolution), Žižek makes a pointed and convincing case that humankind’s collective response to the reality of the imminent collapse of capitalism parallels the traditional five stages of grief: denial, anger, depression, withdrawal and finally, acceptance. His work here demonstrates as clearly as any of his previous works that he is – as I have argues before in these pages – one of the keenest critics of global capitalism, to whom the Church must lend an ear as we seek to discern the signs of the times. Yoder did not reject Constantinianism on behalf of an ascetic withdrawal of believers from social life: aware of the limitations of democracy, he understood “being Christian” as involving a non-reconciled political standpoint. The primary responsibility of Christians is not to take over society and impose their convictions and values on people who do not share their faith, but to “be the church.” By refusing to repay evil with evil, by living in peace and sharing goods, the church bears witness to the fact that there is an alternative to a society based on violence or the threat of violence (129).